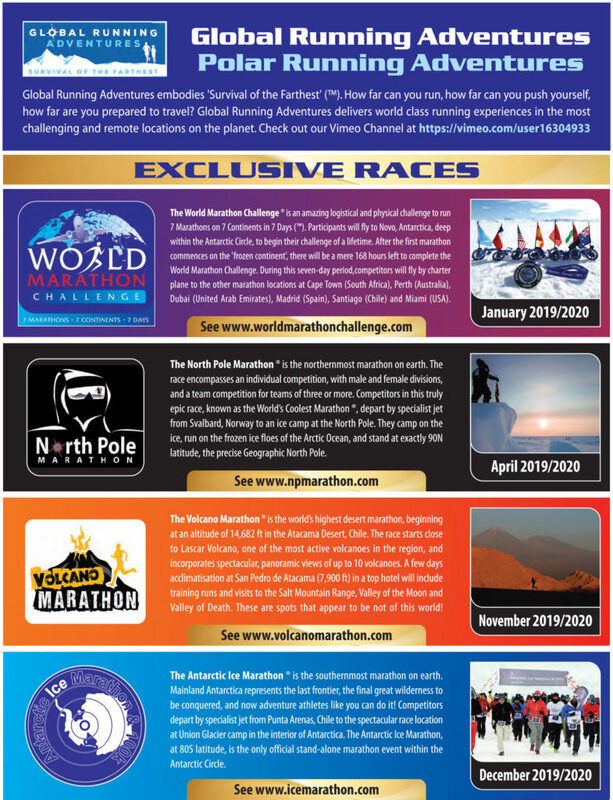 The World Marathon Challenge ® is organised by Global Running Adventures, Ltd. Global Running Adventures also organises the world's most northerly marathon, the North Pole Marathon®, the world's most southerly marathon, the Antarctic Ice Marathon®, and the world's highest desert marathon, the Volcano Marathon®. Working with a network of associate specialists, including the world's foremost logistics experts, the company delivers world class events in the most remote parts of the planet. Global Running Adventures embodies 'Survival of the Farthest' (™). How far can you run, how far can you push yourself, how far are you prepared to travel? Global Running Adventures delivers world class running experiences in the most challenging and remote locations on the planet. However far you want to go, Global Running Adventures is the answer. Whether it's the world's northernmost marathon, the world's southernmost marathon, the world's highest desert marathon, or the ultimate World Marathon Challenge, it's about survival of the farthest. By competing in the World’s Coolest Marathon ®, the North Pole Marathon ®, you can become one of a truly select few to race at the top of the world - at the Geographic North Pole. And you will feel on top of the world when you manage to overcome the extreme sub-zero temperatures to finish 26.2 miles at one of earth's farthest extremes. The Antarctic Ice Marathon ® at the opposite end of the planet provides competitors with underfoot conditions of snow and ice throughout, an average wind chill temperature of -20C, and the possibility of strong Katabatic winds to contend with on the frozen continent. Lying between these far polar extremes is the Atacama Desert, the driest place on earth, and the location for the Volcano Marathon ®. Can you handle the extremes of 14,600 ft altitude and high temperatures to finish one of the most scenic marathons in the world in Chile, South America? Or push yourself to the limit by running the amazing World Marathon Challenge ®. The first marathon of this 7 Marathons 7 Continents 7 Days begins at Novo (Antarctica) and then proceeds to Cape Town (Africa), Perth (Australia), Dubai (Asia), Madrid (Europe), Santiago (South America) and Miami (North America) . Richard has participated in many extreme locations around the planet including the Arctic and Antarctica, the Sahara and Atacama Deserts, the Andes and Himalayan mountains and the Amazon Jungle. He has represented Ireland at international level in ultrarunning and has won the Inca Trail Marathon, Himalayan 100-Mile Stage Race, Antarctic 100k, Everest Challenge Marathon and South Pole Marathon. He has also run across three continents. In 2012, Richard set the current record for running marathons on all seven continents when completing a solo world marathon challenge in 4 days 22 hours 3 minutes. In the summer of 2015, he ran 3,200 miles across the USA from San Francisco to New York in the Trans North America Run and in 2016 he completed a 3,000 km Trans Europe Run from Istanbul to Rotterdam, which was followed by an 1800 km Trans South America Run in 2017. Richard has been an organiser and Race Director of Home Nations Championships, Commonwealth Championships and World Championships. In 2009, he was Race Director at both the Anglo Celtic Plate ('Home Nations' 100km) and the Commonwealth Championships 100km at road running. In 2011, he was organiser and Race Director of the IAU Trail World Championships where he was awarded an Order of Merit by the International Association of Ultra Runners for impeccable organisation. Richard was subsequently appointed Race Director at the inaugural Commonwealth Championships at Trail Running. Richard held the post of Chairman of UltraRunning Ireland from 2005-2012 before being elected to the position of Executive Director of the International Association of Ultra Runners, the world governing body for the sport. 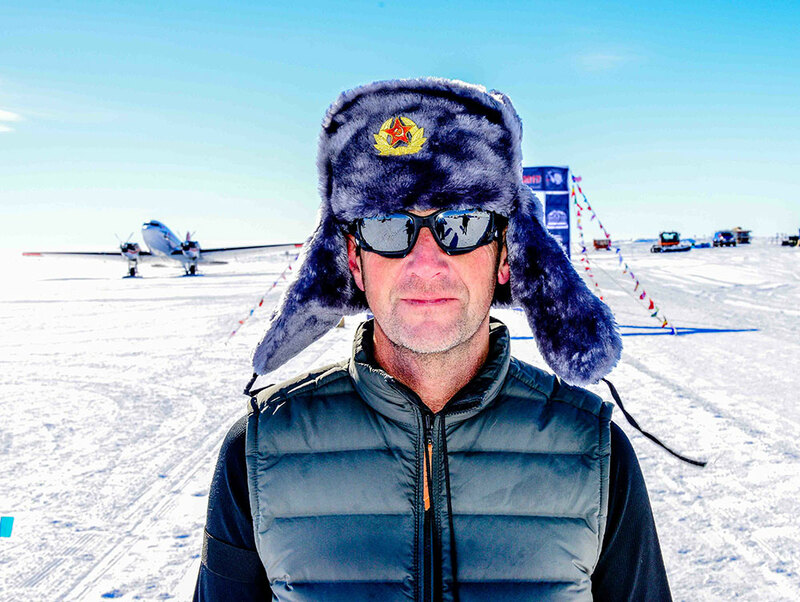 Leading international magazines have published feature length interviews and reports on Richard’s adventure race performances. He has also featured in various documentaries, including the world syndicated BBC programme ‘Desert: The Challenge’, which was narrated by Mike Stroud. In 2012, a one-hour documentary by TV Globo on the Antarctic Ice Marathon & 100k event was nominated for an International Emmy Award. A former consultant economist, Richard was educated in Ireland and the USA and received postgraduate academic scholarships in both countries. His brother Paul was a two-time Olympian, World Indoor silver medallist and multiple US collegiate champion on the track. Numerous personnel work on projects for Global Running Adventures throughout the year, including some of the world's top sports photographers, videographers and medics.